I was asked this week to provide a day of training for teacher leaders who facilitate professional learning communities within their district. The K-5 PLCs are grade level teams while the 6-12 PLCs are content focused. The request asked that I also introduce peer coaching and how it would support the work of PLC’s. Stephanie Hirsh from LearningForward posted a blog, A PLC Pop Quiz for the New Year on September 17, 2012 where she posed 13 questions to help assess elements of PLCs that are critical for getting results for teachers and students. 1. 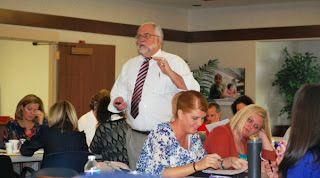 Is our PLC committed to fostering collective responsibility for improved student performance? 7. Is the PLC evaluating student, teacher, and school learning needs through a thorough review of data on teacher and student performance? 10. Is the learning supported by job-embedded coaching or other forms of assistance to promote the transfer of new knowledge and skills to the classroom? 11. Is the PLC assessing regularly the effectiveness of the professional development in achieving identified learning goals, improving teaching, and assisting all students in meeting challenging state academic achievement standards? I found a survey continuum titled, “Noncoaching Culture or Coaching Culture?” in the book Creating a Coaching Culture for Professional Learning Communities by Jane A. G. Kise and Beth Russell. As I examined words on the continuums: sharing, debating, challenging, working through conflicts, I connected with the needed relationships that could be built with peer coaching. 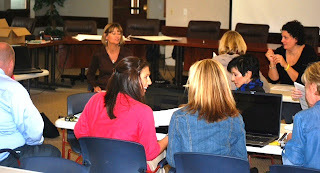 Beachwood, Ohio teacher leaders build PLC facilitation skills. A level of trust and respect among members allows PLCs to do the hard work of identifying where learning outcomes are short and uncover opportunities for teaching to be more effective. My experiences illustrate that when teachers conference with each other opportunities are created to share and hear beliefs and values in conversations that differ from the group discussions of PLCs. Observation of a colleague where one sees those shared beliefs and values in practice strengthens respect in each other. A PLC’s work should lead to changes in teacher practices that change student behaviors leading to increased achievement. Those changes in teacher and student behavior occur before the outcome of increased achievement happens. Peer coaching is the ideal process to gather data first hand to document that the new teacher behavior is happening and that the desired impact on changed student behaviors is occurring. Simply measuring student assessment data may not provide a clear picture of exactly what has happened. PLCs are designed to create a collective responsibility for student success. Teachers observing in each other’s classrooms meet the students for whom they are accepting responsibility. I often push PLCs to put names on student data to increase urgency and commitment. Putting faces to names is even stronger. When peer coaching teams from a PLC focus on the success of an identified group of students, collaboration is built.